Can a Shrimp-Counting Restaurateur Fix Vermont's Health Care System? Al Gobeille is neither an ideologue nor prone to hyperbole. But ask him to identify the biggest threat facing the country today and he doesn’t hesitate: the American health care system, he responds — and, by default, Vermont’s. Last week, Gov. Peter Shumlin formally appointed the 49-year-old Burlington businessman and Shelburne resident as head of the Green Mountain Care Board. The five-member board — Gobeille’s is the only full-time paid position — is charged with overseeing the implementation of Vermont’s health care reform law, which aims to slow rising insurance rates, control hospital expenditures and contain health care delivery costs. Gobeille, who’s served on the board since its inception two years ago, took over from Anya Rader Wallack, who is considered to be the chief architect of Vermont’s health care reform legislation. Why did the governor choose a Burlington restaurateur with no experience in the health care industry — and little formal training in business, economics or finance — to oversee the nation’s most ambitious health care reform effort? Those who know Gobeille say it’s a testament to his intelligence, wit, leadership and team-building skills, as well as his ability to distill large amounts of information into terms everyday Vermonters can understand. Gobeille says that in order for health care reform to succeed in Vermont, it must run like a good restaurant: It must be efficient and affordable, keep its health care customers healthy and satisfied, and pay its “servers” — hospitals and health care providers — well. If it can do all that, he says, the establishment will thrive. Otherwise, it’ll go belly up. And Gobeille knows what it takes for a business to succeed. 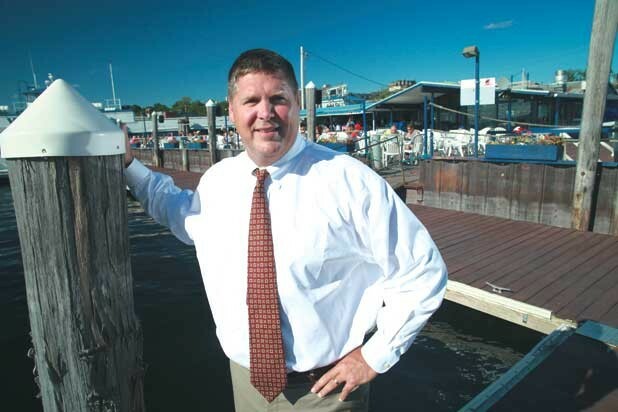 His company, Gobeille Hospitality, owns four restaurants and catering businesses in Burlington: Shanty on the Shore, Burlington Bay Market and Café, Breakwater Café and Grill, and Northern Lights Cruises. With 230 employees, Gobeille has a unique perspective on skyrocketing health care costs. A few years ago, he says, a family insurance plan for a full-time employee cost $2000 year and had a modest deductible. Then it went to $11,000 a year with a $3500 deductible. By 2018, he notes, the same insurance coverage is expected to cost $25,000 with a $10,000 deductible. Such double-digit cost increases hit even closer to home when Gobeille’s son needed abdominal surgery a few years ago. Between deductibles, copays and prescription drugs, he paid $21,000 that year for his family’s health care — despite being “insured.” It dawned on him that if one of his employees faced the same dilemma, half of their gross salary could go to pay for a health care emergency. Gobeille was on the board of the Visiting Nurse Association of Chittenden and Grand Isle Counties when he was first appointed to the Green Mountain Care Board. He resigned to avoid any potential conflict of interest — but not before VNA president and CEO Judy Peterson noted his knack for boiling complex issues down to simple analogies. Friends and colleagues say that roll-up-our-sleeves approach to problem solving allows Gobeille to relate to everyone from the dishwashers in his kitchens to the CEOs of Vermont’s 14 hospitals. Not surprisingly, he earns praise on many levels. Falko Schilling, consumer protection advocate for the Vermont Public Interest Research Group, has a similar view. Gobeille served as board chair of the Burlington Business Association until his four-year term ended in April. Whether he was attending a committee meeting or giving a speech at an annual dinner, BBA members couldn’t miss his deadpan sense of humor. Gobeille, 49, was born and raised in Wakefield, R.I. Although both his parents were health care professionals — his father was a doctor and his mother a medical technologist — his father left home when he was very young, so he doesn’t remember his dad’s medical practice. Gobeille first came to Vermont to attend Norwich University, where he studied biology and for a time considered a career as a physician or laboratory researcher. But at Norwich, his true “major” was the armed forces, and after graduating as a second lieutenant in the U.S. Army, he served four years on active duty, then another six in the Vermont National Guard. The unexpected transition from food prep to health care policy left some people scratching their heads, but Gobeille seems to be winning over the skeptics with a combination of charm and common sense packed into seven-day, 80-hour work weeks. Paul Harrington, executive vice president of the Vermont Medical Society, which represents two-thirds of the state’s 1800 physicians, admits that his organization initially had “a lot of questions” about Gobeille’s “unusual appointment” to the Green Mountain Care Board, largely due to his lack of experience. However, Harrington has since changed his mind about Gobeille. That much was evident last week after former Vermont governor Howard Dean, himself a physician, criticized national health care reform efforts, including those in Vermont, for not checking the rise on costs. Gobeille didn’t take Dean’s remarks as personal criticism but rather as ignorance of the progress Vermont has already made.